Granite pavers are an easy way to add a classic finishing touch to an outdoor fire pit. Pavers are already shaped, available in triangular capstones and in curved curbstone, so assembling a ring around an existing fire pit capped with shaped capstones is no more difficult than stacking the pieces and gluing them together. 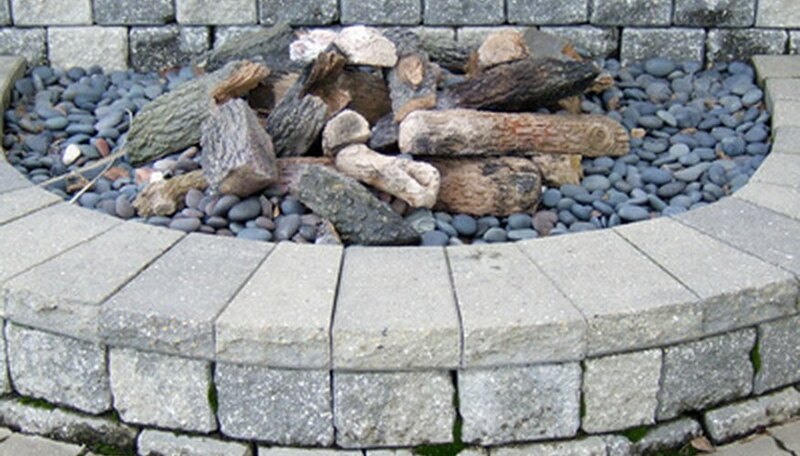 A fire pit made from concrete or cinder block and mortar, and lined with fire brick is ready for granite finishing stones, as the concrete block and fire brick provide the granite stones necessary protection from the fire's heat that would otherwise cause the granite to crack and/or discolor. Dig a slim trench with a shovel the width of the pavers around the fire pit, to a depth of 4 to 6 inches, and set the first tier of curved granite pavers in the trench end to end, curved side in, up against the outer wall of the fire pit. Clean the outside of the fire pit wall with a stiff wire brush to remove any dirt or debris so the concrete adhesive adheres cleanly to the surface. Set a level on each paver, one paver at a time, and move the soil around beneath the pavers with the hands until each granite paver is level. Insert a tube of concrete adhesive into a caulking gun, lift one of the pavers and squeeze a liberal amount of adhesive on to the inside surface. Put the paver back and press it up against the outer wall of the fire pit to create a bond between the paver and the fire pit wall. Repeat this process with the rest of the granite pavers. Squeeze a liberal amount of concrete adhesive on the top of the first tier of pavers and on the outside of the fire pit wall in anticipation of the second tier of pavers. Set a second tier of curved pavers on top of the first tier so that the middle of each block sits directly above the meeting ends of the pavers beneath. Nestle each paver into the adhesive beneath it and press each paver up against the adhesive on the outside of the fire pit wall to secure it to both surfaces. Repeat steps 5 and 6 until the outside wall of the fire pit is covered by granite pavers, then squeeze a liberal amount of concrete adhesive on the top of the last tier of pavers in anticipation of the capstones. Set triangular granite capstones on top of the last tier of granite pavers, as close together as possible, and nestle each into the adhesive below it to adhere it to the top of the pavers.